"WHO CAN GET THE JOB DONE RIGHT!" Now It's Your Turn To Work With A World Record Breaker!" Cooksey is a person to person entertainer. He reaches and touches everyone in his audience. I RECOMMEND HIM UNEQUIVOCALLY, AN OUTSTANDING PERFORMER IN ONE. Bill Cooksey is quite capable of promoting, marketing and advertising any individual, group or business of any kind, shape or form. He is well seasoned and experienced in wisdom and knowledge with a unique ability to communicate the desired message from a mountain top or a soap box depending on what is available at the time. There is no limit to his resources of imagination and fresh ideas in motivation, inspiration and creativity. Let him help you "Climb Your Mountain To The Top Of The Top"! Click Here To Download Cooksey's Signature Song, "I'll Climb That Mountain"
Bill Cooksey is a professional, personal consultant in the field of public relations. He has had extensive publicity and promotions experience in entertainment, broadcasting, education, corporate/private ventures and possesses a unique ability to create the catalysts that make special events spectacular. Cooksey has been involved in high level policy and project planning and execution for his own career as a TV/Movie Producer, Recording Artist, Concert Promoter, Syndicated Radio Host and Producer, Guinness Book World Record Breaking Musician/Comic Stage Performer, Newspaper/Magazine Reporter and Columnist, Author/Seminar Instructor and Artist, as well as Advertising/Marketing Director, Corporate Public Relations VP, Master of Ceremonies/Event Planner, and Image Advisor/Consultant to hundreds of national and international clients in the fields of entertainment, private /corporate business and manufacturing/distribution. His corporate clients have included Leiser D-1 Exotic Automobiles as Public Relations Director, Delta Studios and Delco Publishing as VP of Sales, Americana Racquet Club/Harrahs Corp. as PR/Promotions Director, Limited Snowboards, Inc as Event Planner/Public Relations, Peppermill Casino Corp. as Advertising/Marketing Consultant, Fred Olen Ray's Firebird Motion Picture Productions as Financial Consultant/Technical Advisor, Lemon Tree Hotels as Advertising/Promotional Consultant, Lowe's Hardware Stores National Chain East Coast Spokesperson, Promotional Event Planner for hundreds of Automobile Dealerships, Banks, Hotels, Radio Stations and other numerous profit and non-profit organizations from coast to coast. Personalities and celebrities who utilized Cooksey's Promotional/Musical skills and talents on and off stage have included stars like Chuck Berry, Del Shannon, Bo Diddley, Jerry Lee Lewis, Blood, Sweat And Tears, The Ramsey Lewis Trio, The O'Jays, The Drifters, The Coasters, The Shirelles, The Dixie Cups, The Box Tops, Paul And Paula, Gary U.S. Bonds, Little Anthony's Imperials, Roy Hamilton, Clifford Curry, Bobby Lewis, Rufus Thomas, The Dovells, Lighthouse, Jimmy Elledge, Jewel Akens, Dallas Frazier, Walter Scott, The Ink Spots, Guy And Carmen Lombardo, Freddy Fender, Grampa Jones, Marylin Chambers, Vic Dana, Bob Crane (TV's Hogan's Heroes), Wayland Flowers And Madam, The Orlons, Robert Goulet, Bobby Darin's Road Band, Wilburn Brothers, Red Stegall, Roy Head, Little Robert Parker, Barbara Fairchild, The Tams, Gary Lewis And The Playboys, Lee Greenwood, Joe Frazier, The Swingin' Medallions, Dennis James, Ronnie Dove, Johnny Carver, Don Covay, Inez And Charlie Foxx, The Vibrations, Stan Musial, Major Lance, Bill Deal And The Rhondels, Pete Barbutti, The Left Banke And Many, Many More Wonderful Artists who have made their marks in the entertainment industry! Cooksey's involvements in the print media have included being an exclusive correspondent for "Steppin' Out Magazine" in Las Vegas, distributed throughout Florida and Atlantic City; Columnist for "Entertainment Vegas-Style" weekly; Show reviews and entertainment columnist for "Las Vegas Sportsline Newspaper"; Special Features and Freelance writer for "Vegas Horsetalk Magazine" and other publications around the country. Cooksey has been on the VIP invited press list of every major resort property in Las Vegas and continues to maintain his valuable press contacts and personal friendships in media, publicity and public relations outlets throughout the US. Personal interviews and show reviews of celebrities have included Kenny Rogers, Dolly Parton, Tom Jones, George Burns, Paul Anka, Frank Sinatra, Joan Rivers, Tony Orlando, Merv Griffin, Mickey Gilley, David Copperfield, David Brenner, Liberace, Debbie Reynolds, Shirley Maclaine, Harry Anderson, Anne Murray, Rick Nelson, Tina Turner, Eddie Rabbitt, Dom DeLuise, Glen Campbell, Waylon Jennings, Bobby Vinton, Wayne Newton, Jenny Jones, Engelbert Humperdink, Mamas and the Papas, The Association, Chubby Checker, Tammy Wynette, Jack Jones, Mel Tillis, Jim Stafford, Gallagher, The Unknown Comic, Diana Ross, T.G Shephard, Dottie West, Jenny Jones and it seems the list is endless. Cooksey's broadcasting and film ventures have included his own TV show "The Wild Bill Cooksey Show" produced by Gulf-Western/Paramount from 1972-74, syndicated around the country in 1800 cable markets and winner of Gulf Western's 1973 award for "Best Independent Cable Show"; Co-Producer/Actor in the Fred Olen Ray Firebird Motion Picture Classic, " Brain Leeches " filmed on location in Orlando, Florida; Cooksey's Guinness Book World Record Breaking Event was the subject of a television documentary produced by Dennis Hamby and Associates, a independent filmmaker formerly with PBS in New York. The video production centered around the fact that 20 years after Cooksey had overcome a 5 year bed ridden illness limiting his ability to walk as a child, he broke a Guinness Book World Record In Las Vegas for endurance; Syndicated Radio Host/Producer of his own shows from 1985 through 1996. The guest interviews in 1995-96 were syndicated to 22 major markets in the USA which aired weekly to a mass coverage of over 100 million potential residents in the total listening areas. The program, "Cooksey's American Carousel" was a "chat around the coffee table" type family show co-hosted by Cooksey's wife, Janae. Their well known guests included Pat Boone, Dave Dravecky, Mickey Gilley, Meadowlark Lemmon, Bo Diddley and hundreds more authors, entertainers, speakers, sports figures and business professionals who have appeared on national programs such as The Larry King Show, CBS, NBC, ABC, ESPN, CNN and all of the many TV talk shows. The Cookseys also wrote and produced all of the entertaining commercials for their sponsors as well as all of their special radio dramas with sound effects. During the years, they did extra promotional remotes on location to interact more with their listeners. Wild Bill and Janae were the featured hosts on the 2000 tapings of the Las Vegas segments for the VH1 TV Network's "Across America" series. The Cookseys showcased key legendary hot spots on a video tour of the World Famous Las Vegas Strip relating personal stories about the resorts and casinos where they had appeared, as well as tales about Superstar celebrities they have worked and interacted with over the years. USA TV Networks tapped Wild Bill in 2001 to be a musical program consultant and songwriter for their fast-paced, summer hit reality series, "Cannonball Run". The show featured a "good-ole down home country bluegrass soundtrack" adding flavor to the crazed actions of the unlikely variety of contestants in unorthodox cars all racing across the country with surprise obstacles to win a big cash prize. Cooksey's interests in the recording industry included producing/performing three successful regional rock hits in the South with his own band in the 60s; recording four originals in Nashville at the encouragement of country singer Marty Robbins, which featured Elvis record legends The Jordanaires (backup vocals), D.J Fontana (drums) and Scotty Moore (guitarist) operating the board. Signed with Chart records to release "Mississippi Hippie" which made the top ten in many country/rock charts in the South. "Woman's World" from the same session was a number one hit across many cities in Florida. "Tender Lovin' Care" was charted on rock/country/gospel and MOR stations east of the Mississippi River and became a standard to be played at many weddings. In 1977, "Tender Lovin' Care" was re-released in a national test marketing and ranked in the top ten in over 150 cities. In 1978, Cooksey released "I'll Climb That Mountain" on an independent label to coincide with the debut of his non-fiction publication of his book by the same name. This song was also recorded by The Thomas Singers Gospel Quartet and was their most requested song in their 300 performances yearly for over an 8 year period. Cooksey also ran his own independent recording studio in Florida where he produced hundreds of commercial jingles for clients himself by dubbing all of the instruments and voices. Over the years he has been a promoter/consultant/arranger/producer/musician on numerous sessions for other friends in the business. Cooksey's involvement with authorship in publications include works like his non-fiction book, "I'll Climb That Mountain", relating the events leading up to, during and afterwards of his Guinness Book World Record Breaking Event in Las Vegas in 1976. Highest praise for the motivational and humorous content of this work have been received by Cooksey from thousands of readers worldwide on every lifestyle level, including one gentleman who has sold over $100,000,000.00 in his own motivational materials and stated that Cooksey's book was the only publication he had found worthy of reading since he read Napoleon Hill's classic," Think and Grow Rich"; Cooksey has compiled numerous workbooks and course materials in association with his motivational seminars, speaking engagements and interactive lectures for the banking industry, educational workshops for parents and corporate sales/marketing meetings around the country; Cooksey co-authored the extensive three volume curriculum," Foundational Phonics", with his wife, Janae. The course has been used since 1994 to teach thousands of students worldwide how to increase their reading skills in live classes and on the Cookseys' web site, USAReadingSchool.com where they have presented "Free Online Phonics Classes On The Net" since 1996;. The program has been included in public and private schools, adult training facilities in the US and overseas, as part of the homeschooling curriculum of thousands of parents who have enrolled their children as students. The program was also used as a major part of a two hour mandatory course for teachers seeking state certification in a college in the Midwest; Other co-authorship is featured in several books compiled from the transcripts of Bill and Janae's "American Carousel" radio interviews with internationally known guests; Future releases of Cooksey publications will include "Priorities", a non-fiction book about goal setting and lifestyle achievement and "Charlie Hazben; Been There, Done That A Couple of TImes Already", a humorous compilation of stories and events about Cooksey's encounters with celebrities and the reality of looking through the eyes of vanity with laughter. And, of course, Wild Bill's 15 year research masterpiece, "NAME POWER POTENTIAL" asking the question, "Why do people expect so much of you after they see in print or hear phonetically the letters in your name?" Cooksey's promotional participation with Business, Government and Community Involvement have included his position as emcee/performer in special events for non-profit organizations like the Southern Nevada Hospital Auxiliary Fundraisers as co-host with Robert List, Governor of Nevada, Senator Richard Bryan's wife, Bonnie, and other notable public officials; Cooksey was handpicked for several campaign special events as the main speaker/emcee/organizer for Governor Bob Miller's re-election as Clark County District Attorney in cooperation with Sig Rogich and Associates, the major campaign force behind the Presidential elections of Ronald Regan and George Bush; Cooksey has also been featured as a roast speaker for the Clark County Commissioners and Master of Ceremonies/Promotions in charity organizational events for the Arthritis Foundation, Boy's and Girls Clubs of America, Florida Shriner's Children's Hospital, Maitre'D's and Captains Association, Jerry Lewis MDA Telephon, Help Them Walk Again Foundation and dozens more national and local non-profit groups; Cooksey was Public Relations Director for the Leiser D-1 Exotic Automobile Corporation in Las Vegas from 1981-83; As Promotion and Publicity Director of Concerts for Halsey Productions, Cooksey's expertise produced great success with major events of 25,000 attendees featuring headliners like Chuck Berry, Del Shannon, The Coasters, Blood, Sweat and Tears, Freddy Fender and other hit recording artists in major arenas nationwide; Cooksey was VP in charge of sales and marketing with Delta Studios and Delco Publishing which maintained photography studios in 18 elite department stores in Texas and the South, as well as special customer promotional events with Texas Banking Institutions; In 1978-79 Cooksey directed the public relations/promotions/publicity/performances for the VIP lounge of the exclusive Americana Racquet Club, a Harrahs property in Orlando that featured concerts with nationally known celebrities; Cooksey has also represented numerous private businesses in NV, CA and Fl as director of all media relations and placement of advertising on TV, radio and in newspapers. Cooksey has received the following honors and awards: Guinness Book World Record Breaker, 1976, Las Vegas, NV and certified by Casino officials and press under the direction of Ben Roscoe, the former personal road manager for Roy Rogers and Gene Autry; Las Vegas Maitre'D's and Captain's Association Community Service Award; Gulf-Western's 1973 Best Independent Cable TV Program; Inducted into the Florida Music Hall of Fame; Co-recipient of the National Finals Rodeo Cartoonist Award; plus hundreds of other awards from local business, entertainment, educational and non-profit groups and organizations across America. As a professional artist, Cooksey has together with his wife, Janae, in most major hotels in Las Vegas, Lake Tahoe/Reno and Laughlin, NV. The Cookseys have used their entertaining caricature presentations as a business promotion vehicle from CA to FL in hotels, casinos, restaurants, car dealerships, conventions, exhibits, on stage and at special events. The list of the thousands of proud owners of original Cooksey artwork include notables like Jay Leno, Frank Sinatra, Lou Rawls, Florence Henderson, Johnny Hart, Charlie Pride, Dean Martin, Ray Stevens, Red Skelton, Diana Ross, Tempest Storm, Mel Tillis, Paul and Paula, The Platters, Pat Robertson, Merle Haggard, Ralph Emery, Tom Jones, Righteous Brothers, Sammy Davis Jr., Bill Cosby, Dottie West, Norm Crosby, Jackie Mason, Donna Fargo, Jimmy JJ Walker, Foster Brooks, The Jordanaires and many more. 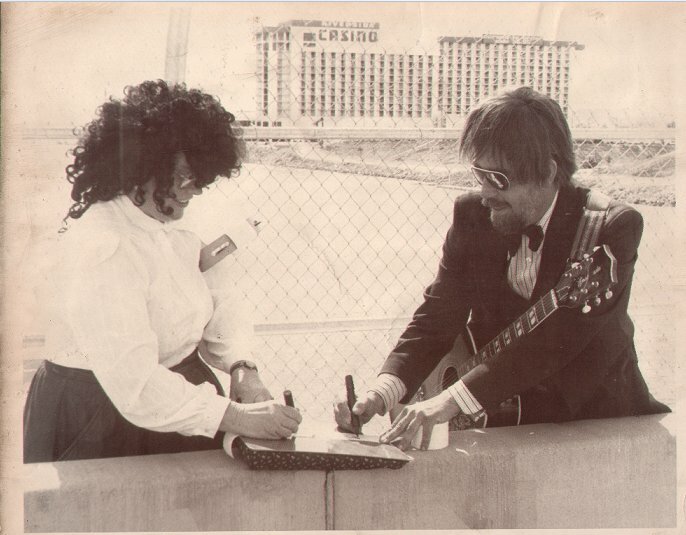 In true Cooksey promotional tradition on February 25, 1988, Bill and Janae began The World's Longest Cartoon on the bridge over the Colorado River at Laughlin, NV, as Bill stood on the NV side of the stateline marker drawing his wife, Janae stood on the AZ side of the stateline marker drawing Bill. The culmination of the project was scheduled to conclude in Las Vegas on May 15, 2005 in conjunction with all the other Las Vegas 100th Birthday Festivities but rumors are that City Party Planners expressed concern that the Cookseys' Event might distract peoples' focus from this once in a Century spectacular. Therefore, though they told the Cookseys that they would deny publically any information that leaked out suggesting the City Party Planners had requested the Cooksey event be moved up to another date on next year's calendar, individuals representing themselves as city officials were overjoyed when The Cookseys generously agreed to this request for re-scheduling at the risk of disappointing so many fans of Cooksey Artwork. The original plans were to have all owners of Cooksey artwork to be allowed to enter their treasures in the World's Longest Cartoon Party Contest and be able to partake of all of the fantastic winners' prizes provided by corporate sponsors of the event. Future plans are for the event to be filmed from the air as all of the Cooksey caricature entries will be laid end to end across the open desert and become, in fact, The World's Longest Cartoon. Anyone who owns original Cooksey artwork from 1986 - 2005 will be eligible. When the formal announcement for the new event date is made on the internet, Cooksey Art owners should contact Wild Bill about bringing their masterpieces to Las Vegas and join in the Big Party! However, before this giant gala display of two decades of Wild Bill and Janae's art renderings are finally presented as a special documentary, Wild Bill will first complete his own solo attempt at creating The World's Longest Cartoon by drawing 50,000 cartoon faces of real people on an extended roll of paper which could reach from the Stratosphere Hotel all the way down the Las Vegas Strip to the World Famous Las Vegas Welcome Sign! Cooksey's success in promotion of the careers and projects of others, as well as himself, is due to his commitment and dedication to get the job done in spite of the obstacles and objections of the establishment. His determination, perseverance and hard work ethic combine with integrity to create new avenues to follow in his quest to reach the end of the rainbow for clients. His game plan is to do as much as he can alone researching and evaluating all of the options available for the success of the project. Once all of the information has been collected, Cooksey becomes the ultimate quarterback team player, directing and executing each promotional action with precise detail and yet with perpetual flexibility. Cooksey's clients can count on the confidentiality of his work with them. Just as speech writers and promotional staff members for professionals with high visibility like the President, CEOs of major corporations and entertainment figures, Cooksey will not reveal any information about his clients or their business for any reason without their total consent. Bill's "never give up" attitude and natural "bounce back" spirit makes sure the ship never sinks and turns the lemon experiences into champagne lemonade. With an entertainer's heart, Cooksey's communication skills break through steel doors and bring the message home to folks who do not wish to hear anything from anyone at anytime. Some observers have labeled him as "Wild Bill" Barnum or "P.T." Cooksey. Bill Cooksey came to my attention when he appeared in Las Vegas. THE FIRST ACT and ONLY act that I had seen other than SHECKY GREENE in New Orleans, circa 1952, that could go five and six hours non-stop and not repeat his material. I RECOMMEND HIM UNEQUIVOCALLY, AN OUTSTANDING PERFORMER IN ONE. I always look forward to his return performances in Las Vegas. After being selected as the Las Vegas hosts for upcoming segments of VH1 Television Network's "VH1 Visits Vegas" presentation, Wild Bill and Janae Cooksey were indeed in rare form on the first day of production with the visiting VH1 New York film crew. The tapings featured the crazy antics of the Cookseys as tourist guides taking the viewers from one end of the famous Las Vegas Strip to the other and included a special interview with well known Mayor of Las Vegas, Oscar Goodman. Besides showcasing the madcap talents of Wild Bill and Janae as the fun hosts in these special segments, VH1 producers will also be profiling the colorful careers of the Cookseys during their eventful years in entertainment, broadcasting and education for airing in vignette format throughout the Spring of 2001. USA Television Network Executive Producers have commissioned Wild Bill Cooksey to write a special series of original lyrics and melodies for the Summer Smash Reality Program, "CANNONBALL RUN 2001". Cooksey's Southern roots play an important part in how these "down-home" foot stompin' tunes fit right into the overall events and circumstances of teams of plain folks driving some souped up vintage cars from coast to coast in the effort to win the giant cash prize at the end of the trip. When you need great soundtrack music, "Who Ya Gonna Call?" That's right! It's Wild Bill to the rescue one more time! Cooksey's original song, "Say A Prayer For Our George", which encourages all Americans to stand behind our President during this important time in our nation's history, is being heard in major US cities like Washington, D.C. and Dallas as Bill sings this inspiring song live on radio programs with just a guitar and his vocal presentation. Call 702-773-5809 For Free Consultation and For More Info On How We Can Get Your Business Or Personal Message Out To The World, Submit Your Own Press Release To Us Today ! WARNING: You just never know where this character is going to pop up next! As you can see, the above biography definitely establishes Bill Cooksey as a successful professional quite capable of promoting, marketing or advertising any individual, group or business of any kind, shape or form. Cooksey is the perfect Speaker, Motivator, Emcee, Host, Announcer or Spokesperson for all special events, occasions and projects. He is well seasoned and experienced in wisdom and knowledge. Let him help you "Climb Your Mountain To The Top Of The Top"! Please return to vegaswatchdog.com to find all contact information. Click here. THE FOLLOWING EVENT BEGAN ON SUNDAY, MAY 27, 2007, WITH WILD BILL DRAWING JANAE AT THE CORNER OF ST. LOUIS AND LAS VEGAS BOULEVARD SOUTH IN FRONT OF THE STRATOSPHERE HOTEL AS THE FIRST CARTOON ON THE 5.7 MILE ROLL OF CASH REGISTER TAPE TO BE FINISHED ON OR BEFORE LABOR DAY 2007 WITH THE LAST CARTOON DRAWN AT THE FAMOUS LAS VEGAS WELCOME SIGN. GET INVOLVED AND JOIN IN ALL THE FUN. JUST READ ON FURTHER AND SEE HOW YOU CAN PARTICIPATE!!!! BUT THE WORLD MAY NOT HAVE TO WAIT THAT LONG! The Good News Is That It Could Actually Be Completed Before The Designated Date As Wild Bill Begins His Quest To Draw One Extremely Long Paper Roll Of Cartoon Faces From The Stratosphere Hotel At The Beginning Of The Strip To The Famous Las Vegas Welcome Sign At The South End Of The Strip, A Distance Of Five And Seven-Tenths Miles Long. Performing This As A Solo Adventure, Wild Bill Would Be Finishing The Goal He And His Wife Began In 1988 To Create Worldwide Awareness For The World's First Free Online Reading School They Began In 1994 Which Has To Date Helped Over 50,000 Students Globally Improve English Reading Skllls. Cooksey's Vision Is To Draw One Face For Each Of The Fifty-Thousand Students Who Have Benefited From This Program Since 1994. Wild Bill Would Indeed Welcome All Business And Individual Supporters Who Would Like To Come On Board With Him To Complete This World's Longest Cartoon! The Beginning Of The Event Was Documented In "The Laughlin Gambler" Newspaper When Wild Bill and Janae Cooksey officially began the World's Longest Cartoon in the center of the Arizona - Nevada State Line Bridge connecting Bullhead City and Laughlin on February 25, 1988. With Janae Standing On The Arizona Side Of The Line And Wild Bill Standing On The Nevada Side Of The Line, Both Artists Made Drawings Of Each Other On The Same Piece Of Extended Cash Register Tape. WITH THE MESSAGE THAT WILL GUARANTEE AMERICA'S FUTURE AFTER 2008. THE USA IS ONE GREAT PLACE TO LIVE. SO LET'S KEEP IT THAT WAY, OKAY? THE SONG SAYS IT ALL AND JUST LIKE THE "NIKE" COMMERCIAL, JUST DO IT! I appreciate you sharing your song with me. leadership position to strengthen Nevada and the nation. Click Here to view Handwriting Analysis Entertainment Services, the Cooksey website that displays all the professional graphology services Wild Bill offers for Legal, Business and Personal Clients, plus extensive analysis reports of well known celebrities complete with detailed text and colored graphs. While You Are Browsing Over This Page And Checking Out The Links, You Might Enjoy Listening To The Vegaswatchdog's Special Musical Tribute To All The 50,000+ students, supervisors and supporters who have been actively involved in the last decade with The Cookseys' original free online phonics reading program, usareadingschool.com . When you hear the lyrics you will see why The Cookseys have never turned away anyone who wanted to learn to improve English reading skills. The download to your desktop might take a few minutes, but we think you'll be touched and want to share it with someone else who cares about other people too. TO HEAR WILD BILL'S LIVE DEMO OF HIS LATEST ORIGINAL, COPYRIGHTED SONG, "TEACH SOMEBODY TO READ", JUST CLICK HERE. If you or someone you know would like to partner with us on getting this song professionally produced and/or recorded by a well known artist, please contact us at 702-254-6092. And be sure today to take the time to help "Teach Somebody How To Read". It will not only change their life. It will change yours too! To View A Variety Of Some Of The Numerous Videos Wild Bill Has Made For Sites Like YOU TUBE, Click Here.